Call for a free trial today! Auto Repair Shop Management software for the small to medium shop. Cloud, Phone App, Mac and Windows versions available. 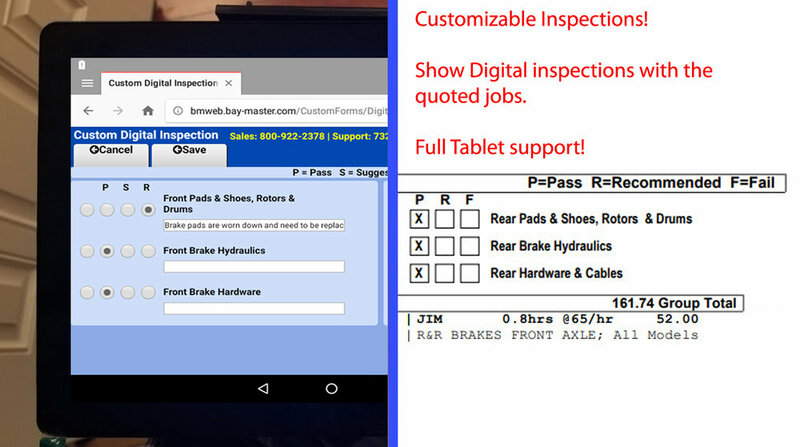 Custom Digital inspections from your computer or tablet! At just a fraction of the cost! Bay-masteR is a comprehensive auto repair shop management program that helps you keep your shop running like a well oiled machine. Our point of sale software simplifies the ticket writing process to save you both time and money. Whether you are already using a shop system or not, Bay-masteR has a number of features that you can add or remove at will, customizing your experience to run the business the way you want. Writing car maintenance tickets has never been easier. Looking for the best auto repair shop software? Look no further than Bay-masteR. Call us directly at (800) 922-2378 to get a free trial and demo today! Bay-masteR Shop Management Software offers online ordering and cataloging through SpeedECat, Bay-masteR directly integrates with suppliers such as NAPA, O’Reillys, Autozone, Advance, CarQuest, Worldpac, Nexpart, and over 90 more. 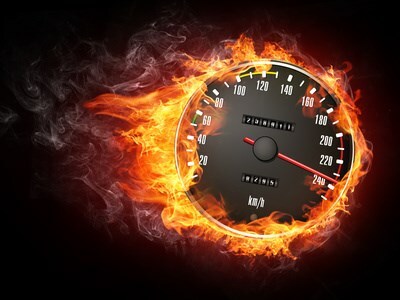 Speed ECat is the go to solution for online parts ordering, designed not only for speed, but also ease of use. The first time you can locate and order parts right from the same screen. Bay-masteR’s tire guides show real time stock information directly from American Tire Distributors as well as K&M Tire, you even get tire fitment information and tire specs. With just a few clicks you can place your entire order directly through Bay-masteR, saving you valuable time. In a matter of a minute you can build a tire job and place the order in Bay-masteR without the need to order parts from a website and then re-enter them into the software. Such a small addition, but it saves you tons of precious time. Built into Bay-masteR as well are labor guides using MOTOR’s technical databases, as well as an interface to ALLDATA online. Also offered with Bay-masteR is full inventory control with purchase orders, vendor lists, automatic stock replenishment, and a unique sliding margin system customizable for each customer to fit their needs. One of our most popular features to date is the Marketing feature. How often are you getting you customers back in the door? With our marketing feature you can print postcards, labels and even send customers personalized emails when they are due for service, such as an oil change. Even track your ROI (return on investment) through the Marketing feature in Bay-masteR! Need an easy to use and accurate way to track your employees hours? The timecard module in Bay-masteR allows you to generate productivity and payroll reports, keep track of employee productivity right from your auto shop management software! Save a ton of time by creating Canned Jobs in Bay-masteR. Instead of starting from scratch when creating a ticket for a common repair or replacement, you can pre-build these common jobs so that with the click of a button you are well on your way to having a completed ticket. Make the process even faster by setting up jobs to bring up specific online catalogs to look up parts and labor that you know you will need. Use the preventative maintenance schedules straight from Mitchell eDATA or ALLDATA online to upsell your customer right in the shop!